Hey, everyone, I hope that the riding, running and racing season has been a rewarding one! It has been a long while since I posted lessons learned post and was thinking about some of the new the new things I have been putting into practice this season while racing in Individual Time Trials. I have spent the better part of the last 2 seasons working on my Time Trialing and competing in several TT series in the Mid West. I hope you don’t mind but this will not be my typical prose but instead, more of a laundry list of dos, don’ts and discoveries. Your mileage may vary! It’s hard to get ready and get into the mindset of racing if you are running behind. You become more anxious which inevitably leads to added stress and forgetfulness. Showing up to a race with a poorly shifting drive train, loose aero bars, broken cleats, under or over inflated tires and or the wrong cassette will lead to a poor performance or disaster. Making last minute changes to bike fit, drive train tuning or even tire pressure can also result in poor performance. Have the bike ready to go at the beginning of the week. Check, double check and triple check the weather so you know which wheels to bring to the TT. See weather remark above. While Tri spoke front wheels and discs look cool and are fast they are downright confidence shredding in strong crosswinds so bring an extra set of lower profile aero wheels. Get religious about stretching so that all the power that goes into the bike isn’t destroyed by a poor aero position. Practice getting your head down as far as you can to get “turtle” and cut the wind faster. If there continue to be problems in your races then it’s time to train these problems. Don’t like descending or cornering while in the aero bars? Find shorter hills and wider corners and start practicing. Don’t like climbing hills while aero? Get out do some aero hill repeats. Most tactics in a time trial are about pace setting and negative splits. If the wind changes on course and you have a strong tail wind going out you may want to change your tactics. It also depends of course how strong the head wind is on the way back! If you find that you are getting passed quite a bit by cars and trucks you may want to kick up the pace just a bit to take advantage of the slight vacuum/draft effect when the vehicle passes. I am not talking motor pacing or drafting a vehicle that will get you disqualified! Having a power meter in training is becoming a must for seriously competitive cyclists. In a TT it’s almost miraculous. It’s impossible to screw up a pacing strategy in a TT if you are using a power meter appropriately! The shorter the race the longer the warm up. The longer the race the shorter the warm up. Warm up on the course and if time permits finish warming up on a trainer. Show up to the starting line with a STRONG heart Rate and warm muscles or else be ready to suffer more than usual. Competitive cyclists need to regulate their body temps in hot summer races. Get a shade canopy and do your bike set up, warm up and cool down under the tent. Drink, drink and drink some more. Don’t want to spend big bucks on a cooling vest? Don’t grab a thin material sock or hosiery and fill it full of ice, wet it down and drape it around your neck. You will be amazed at how much better you will perform. Try it during your warm up and have a spare one ready to go for the race too. If you fight with race day jitters or the all too frequent what did I forget syndrome when driving to races take a friend or 2 or 3 with you. The general banter and the fact that most athletes bring 2 of everything with them will help to alleviate anxiety and may help you if you forget something. See the above about bringing friends! Also, it helps to have a check list or packing 2-3 days in advance and double check 2-3 times before the day of the race to ensure you have a worry free race. Go into each and every race with a performance oriented goal and spend your warm up thinking about how you intend to meet those goals. Then spend the race realizing each goal. Following this method will lead to decreased times on the course, faster averages and bigger smiles. All of these little nuggets came about from 2 long seasons of racing countless Individual Time Trials with various teammates. many of these nuggets are my own personal experience and some are from watching athletes that I coach and teammates. If you have any to add to this growing list let us know and leave a comment. 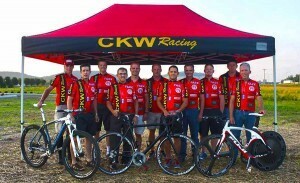 The handsome group in the photo is the team I sponsor, coach and race for, Central Kentucky Wheelmen Racing. The guy on the far end holding up the fast TT bike is yours truly, Coach Rob.